A sapphire single-stone pendant. 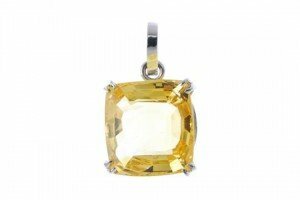 The rectangular-shape yellow sapphire, weighing approximately 19cts, to the tapered surmount. 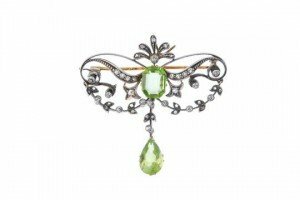 A late 19th century silver and gold peridot and diamond brooch. 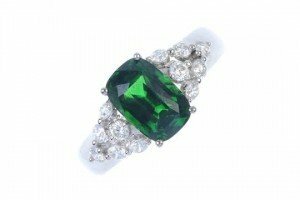 Designed as a rectangular-shape peridot and old-cut diamond scrolling panel, with similarly-cut diamond foliate swags, suspending a pear-shape peridot and diamond accent drop. A garnet and diamond ring. The rectangular-shape tsavoite garnet, between brilliant-cut diamond triangular-shape sides, to the tapered band. Estimated total diamond weight 0.35ct. 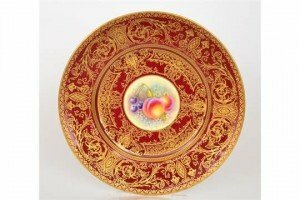 A 20th Century Royal Worcester cabinet plate decorated with a hand painted roundel by R. Price with peaches, cherries and strawberry blossom against a pale lemon ground, the wide border edge in a dark red with a gilt overlay design. 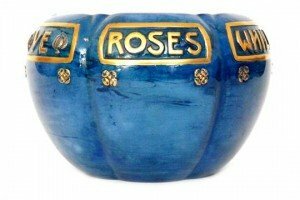 A 1920s Royal Worcester Sabrina Porcelain jardiniere, the lobed body with relief moulded verse ‘While ye may gather ye roses’ in gilt to a blue tonal ground, printed mark with date code for 1926. 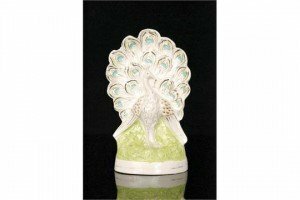 A 19th Century Staffordshire flat back figure of a peacock displaying its feathers and heightened in blue, yellow and black enamel with gilt detailing. 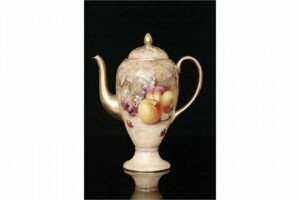 A large coffee pot painted in the round by former Royal Worcester artist Paul English with hand painted apples, peaches and black cherries, the reverse with peaches and grapes. 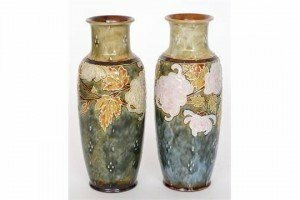 A pair of Royal Doulton stoneware vases each decorated with tube lined pink chrysanthemum flowers and foliage to a mottled green blue ground with tube lined trailing. 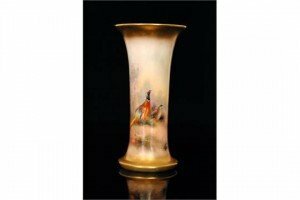 A Royal Worcester trumpet vase hand painted by James Stinton, the body panel decorated with a pheasant and a grouse in a woodland setting, signed. 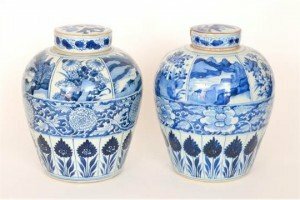 A pair of late 19th Century Chinese export ware ginger jars and covers, each decorated in blue and white with panels landscape and floral scenes with a middle section floral border with flower heads below. 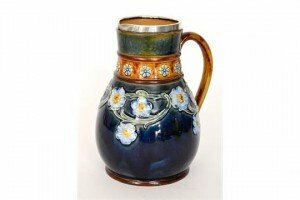 A late 19th Century Doulton Lambeth jug, the whole decorated in a mottled blue green glaze with relief moulded white flowers and foliage to the belly and a band of blue flowers to the neck, the rim with a hallmarked silver collar for 1898. 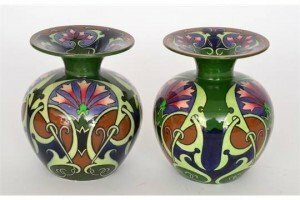 A pair of late Foley Shelley Intarsio vases each of ovoid form with a flared collar neck and decorated in the Art Nouveau style with stylised flowers to patterned frames with similar decoration to the neck. 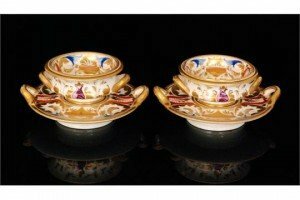 A pair of early 19th Century Derby twin handled table salts raised to matching twin handled stands, each decorated with enamel and gilt palmette and foliate scrolls. 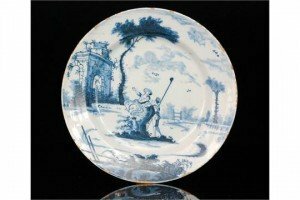 A late 18th Century Delft tin glazed charger decorated with a lady sat upon a branch with her male companion by her side, set amidst a castle ruins with a lake in the foreground and trees in the distance. 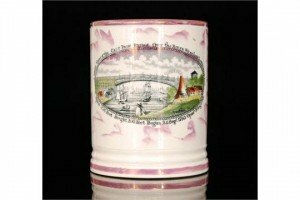 A 19th Century Sunderland Lustre frog mug decorated with a transfer applied scene entitled ‘A west view of the cast iron bridge over the River Wear built by R. Burrow Esq, span 236 feet, height 100 feet begun 24 Sept 1793, open 9th Aug 1796’ the interior with a brown painted mark. 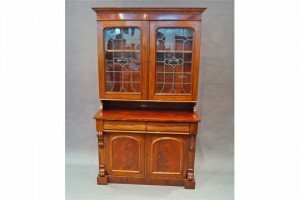 A Victorian mahogany side table, the shaped back with two frieze drawers and two panelled cupboard doors, on plinth base, with an associated glazed two door superstructure. 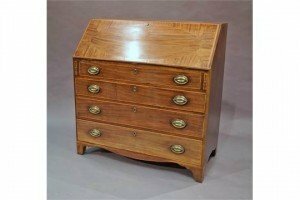 A Georgian mahogany and line inlaid bureau, the fall front enclosing arrangement of drawers above three graduated drawers on bracket feet. 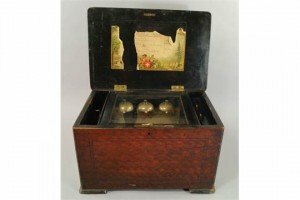 A Swiss rectangular musical box, late 19th/early 20th century, inlaid to the top with musical instruments, playing eight airs, a label to the interior lid with a list, the movement with three bells. 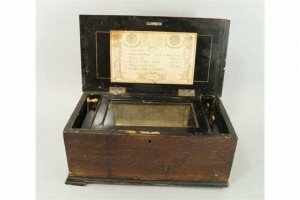 A Swiss rectangular musical box, late 19th/early 20th century, inlaid to the top, playing six airs, a label to the interior lid with a list. 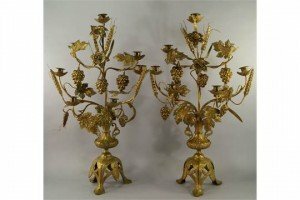 A pair of French gilt metal seven branch candelabra, 19th century, in the form of twin handled vases, on trefoil and anthemion mounted stands, emitting branches applied with leaves, grapes and wheat sheaves.